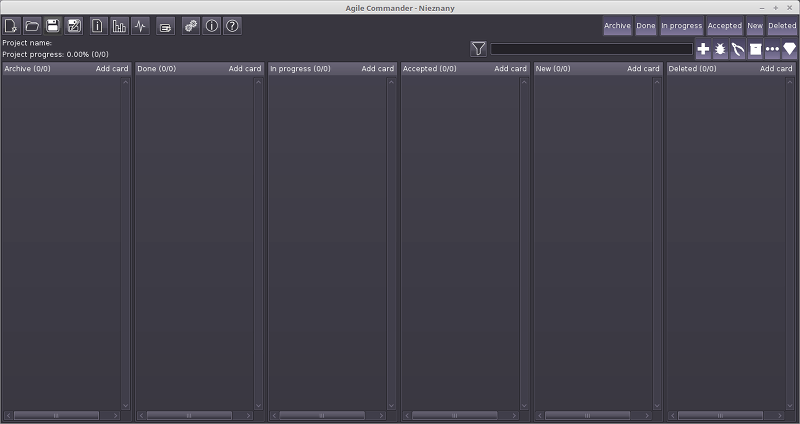 Agile Commander is a kanban board. The main advantages of Kanban are process visualization and limiting the number of tasks in progress. One quick look is enough to determine what we are working on and what will be done next. 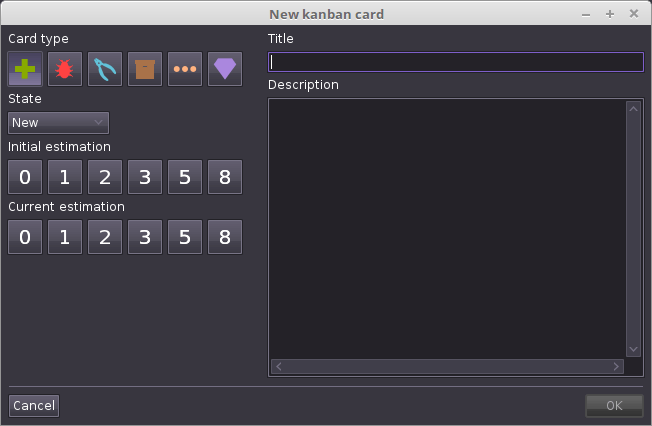 Main window with 6 kanban lists. The cards can be transferred via a drag’n’drop mechanism or a card status change and they goes from the New through Accepted, In progress to Done (and Archive) or in case of deleting to Deleted list. It is always possible to restore the deleted card. The program, in accordance with the rules of the agile manifesto, tries not to limit the actions of the user, it is also possible for example to transfer the deleted card directly to the done list. The significance and priority of a card can be determined by moving them up or down within one list. By clicking Archive, Done, In progress, Accepted, New, Deleted buttons, you can hide the lists you do not need at the moment. 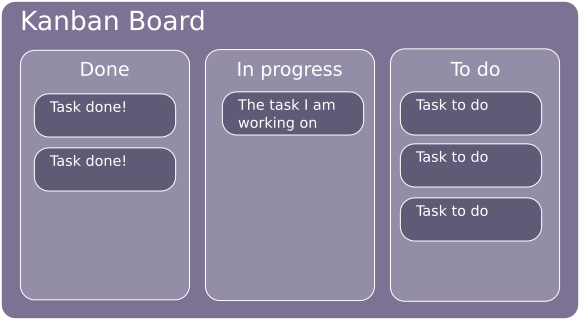 The second fundamental problem that kanban board solves is the attempt to work on too many things at once, which significantly reduces productivity. The solution is to limit the number of cards that can be in the “In progress” list. This can be done in the “About project” window. milestone – milestone marker, this may be the moment of the release of the next version. In future Agile Commander versions will allow the creation of graphs for the range from milestone to milestone. Agile Commander uses the 0,1,2,3,5,8 scale to determine the complexity/labor intensity of the card. Each card type can be estimated. If you don’t want to estimate a card type, select 0. At the beginning of the work on the task, we estimate its complexity and set it as an initial estimate. In the course of work, we change the current estimation, it allows to easily find out how the work on the task progresses. to verify – implemented, but requires testing, code review, client approval, etc. The card can be folded or expanded. The folded card displays only basic information such as the number, title, property icons and the number of checked items on the checklist. In addition, in the upper right corner there are buttons for changing the card’s status. 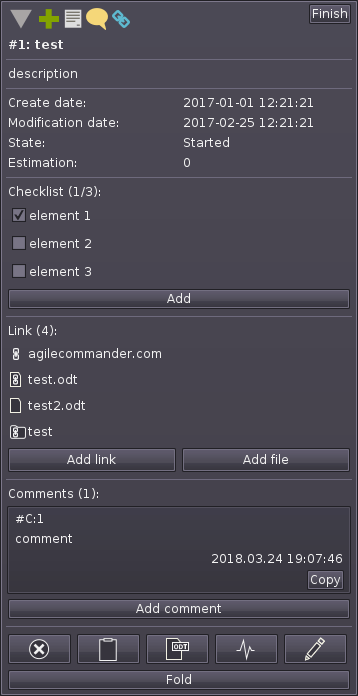 The expanded card also displays the description, date of creation, modification, checklist, list of links and files, list of comments and action buttons.